the starting point: Viana do Castelo, Portugal. the finishing point: between 10 degrees and 25 degrees North and 60 degrees West. USA – two teams: robotboat,team savage. 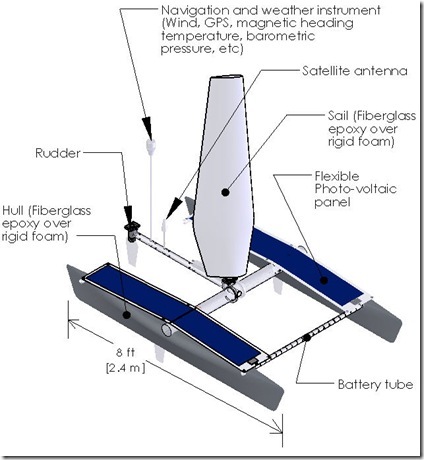 UK – three teams: Aberystwyth University, vagabond, allsopphelikites. France, Austria, Canada and Portugal – one team each. competition is open to individuals, universities, schools and companies. it may take around 2 or 3 months to cross the Atlantic. no limitation on the height of the mast but the keel should ideally be less than 2 metres. boats should have a radar reflector and to have clear warnings that it is unmanned. Here is a sketch of Robotboat Mark III of US. Video clips of fully autonomous sailing boats are here. More details are here at sail-world. Next post: How Safe are the Floating Nuclear Power Plants of Russia ?